Despite many lawmakers’ not knowing many of the details, they voted on the bill with little to no debate, provoking an angry response from a cross-section of New Mexicans once the news of how it passed got out. It was a rare moment for tax policy. Except for that massive tax bill, taxes usually are the quiet kid in the corner during the short budget-making session every two years, with small incremental changes in the tax code slipping through from time to time. But the tax side of the equation deserves more of a public focus, some people say. Shining a light on tax policy isn’t easy. Due to their complicated subject matter, debates over taxes can seem impenetrable, often dampening public interest and making it difficult to determine whether the tax code is fair. Add the historic lack of information that is shared publicly about the tax code itself, and debates usually go one of two ways: they turn into snoozers; or become fact-free zones. Only recently has New Mexico begun to change that, with an annual publication of a list of tax breaks called a tax expenditure report. Major gaps in public information still exist, such as a detailed analysis of the state’s personal income tax, which the Taxation and Revenue Department made public until 2006, when it stopped. But the documents have improved with each new year, according to two experts New Mexico In Depth interviewed. Unlike a state budget, the importance of the tax code can be missed if it is thought of only in terms of its revenue-generating function. Buried within its pages are tax breaks in the form of exemptions, deductions and credits – so-called tax expenditures — that decrease the revenue a state takes in. Some people and companies are favored with tax breaks while others aren’t. Because many of those breaks don’t come with “sunset” provisions, they are rarely reviewed, causing some economists and analysts to call the tax expenditures a “hidden budget”. How much of a hidden budget is an open question. In 2011, some lawmakers and public officials estimated there were more than $1 billion in credits, exemptions and deductions in the state tax code. However, a spokesman for the New Mexico Taxation and Revenue Department in December questioned whether assessing the total value of tax expenditures is even possible. “Many of the expenditures are estimated” and “taxpayers are not mandated, by statute, to report all types of deductions,” Benjamin Cloutier wrote New Mexico In Depth via e-mail. Until recently, the public wasn’t privy to this arcane conversation. That’s because, unlike all but a handful of U.S. states, New Mexico didn’t produce a tax-expenditure report. That changed in late 2013 when New Mexico produced its first one. The state followed up with a second report in 2015. Last year, State Auditor Tim Keller announced the creation of a Government Accountability Office, which he said would assess the expenditures’ return on investment, but the office has yet to complete a report. Both Richard Anklam and Gerry Bradley agree the state’s reports need improvement but they’re getting better. The first tax expenditure report was only 87 pages; the second, 259. Bradley is a senior researcher and policy analyst at New Mexico Voices for Children. Anklam heads up the New Mexico Tax Research Institute. “It gets better every year. The first one was really incomplete,” Bradley said. Still, Bradley sees a major hole in the New Mexico’s efforts to make tax analysis publicly available. Since 2006 the state tax agency hasn’t made its analysis public despite possessing all the data. Anklam, who worked as the tax agency’s policy director in 2003 and 2004, said the person who did the analysis retired and was never replaced. “I completely agree with Gerry,” Anklam said. Cloutier said the agency plans to resurrect the practice of producing a publicly available analysis of the state personal income tax in 2016. In an ideal world, a state’s tax policies strike a balance between sometimes-competing principles; for example, how tax burdens are distributed among taxpayers – fairness — with a tax system that seeks to protect, or spur, economic growth — efficiency. Mix in policy makers’ desire to use tax policy decisions to drive certain social behavior. For instance, think of states that raise taxes on cigarettes. Officials believe higher taxes, and the increased costs that come with it, will discourage a certain number of people from buying cartons of cigarettes. Fewer smokers might save money in government health care costs in the long term, the thinking goes. Add all this together, and you’ve got a complicated mixture of competing goals and interests that policymakers attempt to balance in discerning the state’s ideal tax structure. Tax expenditures are employed to arrive at that ideal structure. A state also can use them to identify taxpayers in need of assistance or to encourage social or economic behavior. But defining ‘ideal’ – or baseline as Anklam calls it — in New Mexico is difficult. That’s because New Mexico relies on a gross receipts tax (GRT) – it is the state’s largest revenue generator – rather than a sales tax. The GRT is a hybrid that captures retail transactions like a sales tax but imposes a levy on business services, too. “We don’t know what our tax is,” Anklam said, referring to the confusion policy makers sometimes feel working with a tax levy that functions as several types of taxes, all at once. That explains in part the fuzziness that comes with determining the value of certain deductions, he said. 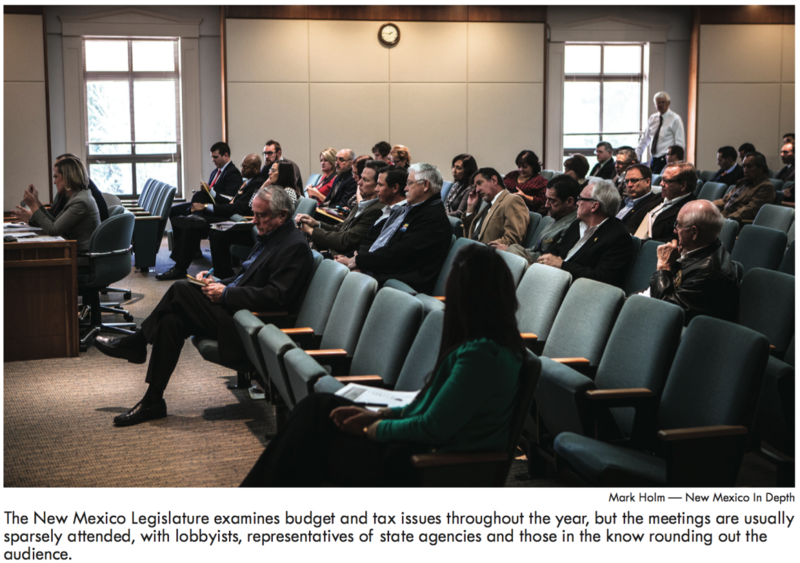 New Mexico’s funky tax structure hasn’t stopped state lawmakers from trying to create a tax expenditure budget over the years. The Legislature passed a bill in 2007, but Gov. Bill Richardson vetoed it. Gov. Susana Martinez vetoed a similar bill in 2011, but issued an executive order later that year ordering the creation of a public accounting of the state’s tax breaks. Reading through the documents one can discern some of the choices New Mexico makes, either to reward behavior or to help various groups. New Mexico exempts active military personnel who live here from paying the state’s personal income tax, a decision that reduced New Mexico’s revenue by more than $11 million in fiscal 2013. Elsewhere you read that New Mexico law allows companies that extract coal to exempt a certain amount of revenue from taxation once the companies reach specific thresholds. The state is worried about the coal industry, analysts say. In fiscal year 2013, companies saved more than $27 million in taxes, up from $11.3 million four years earlier, according to the 2014 tax expenditure report. The tax expenditure provokes questions, too, such as is New Mexico’s annual back-to-school tax-free weekend every August losing popularity? The amount of taxes shoppers have avoided by purchasing clothes and certain goods during that weekend dropped to $3.4 million in fiscal 2013, down from $4.1 million in 2009. Welcome to State Budgeting 101. Class starts when 112 state lawmakers convene in Santa Fe to approve a multi-billion dollar spending plan Gov. Susana Martinez can live with before the session ends Feb.